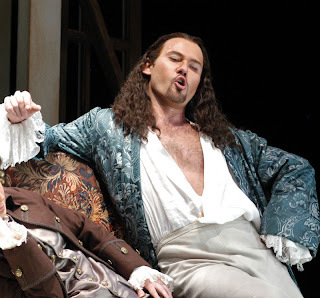 In our countdown, now, to opening night, I’d like to consider the great characters of Le nozze di Figaro in a little more detail. Because while the complications of the plot alone are enough to intrigue and amuse a first-time Figaro attendee, it’s the incredible human richness of the characters--their psychological complexity--that keeps many of us coming back to this opera, fascinated time and again. I love this moment because it’s the only time the Count comes anywhere near acknowledging his own considerable imperfections. This is music that vividly -- even sympathetically -— portrays a man writhing in agony he’s created for himself. If the Count were only capable of mastering his passions, perhaps he’d have a chance of mastering his household.